Penne Rose Pasta - Kosher In The Kitch! 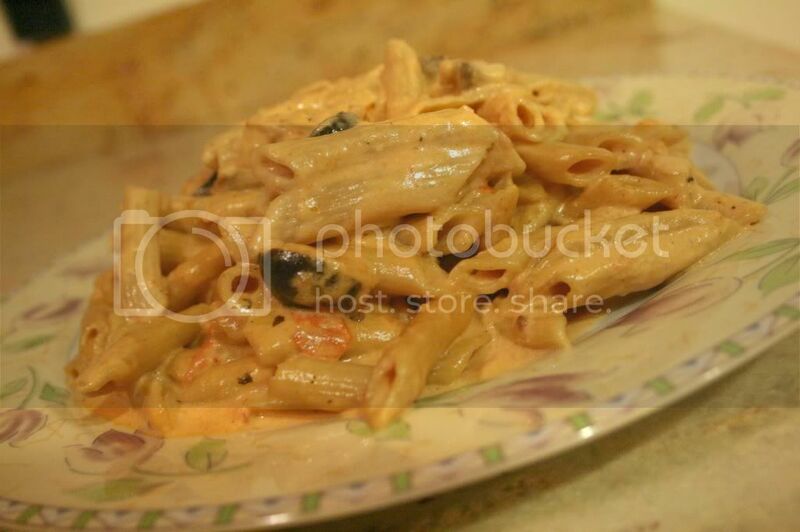 Penne Rose Pasta - Kosher In The Kitch! Boil the pasta with salt and cook until al dente. Heat up the oil in a medium to large pot. Saute the diced onion and then add the tomatoes, mushrooms and black olives. Saute the vegetables for about 5-6 minutes, until the mushrooms are slightly browned. Add the heavy cream and marinara sauce. Once that is combined, add the cheese. Bring to a low boil and stir in the salt, pepper and garlic powder to taste. Keep the flame on low and add the pasta to the pot. Mix it with the sauce and allow it to sit on the fire for a few additional minutes. Then turn off the flame and it’s ready to serve! What if you do not have cream available? Is there anything you can substitute it with? I made this for dinner and it was sooooo good! Totally a recipe that im gonna make over and over b/c so easy and so good! I have used milk in place of heavy cream. It doesn’t come out as thick or as tasty however it’s less fattening and it still tastes good. by grated cheese, you mean parmesan? what kind of cheese are you soposed to use? Mozzarella Cheese however feel free to experiment. This sounds great! I am for sure going to try it. I think I will elave out the veggies since i dont like cooked tomatoes. Is it similar to penne vodka? Also, whats the best marinara sauce to use?